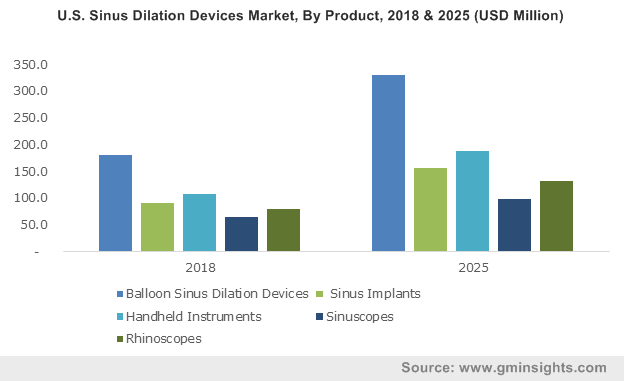 Sinus dilation devices market size was valued over USD 1.6 billion in 2018 and is expected to witness 9.0% CAGR from 2019 to 2025. Surge in adoption of sinus dilation devices in sinusitis treatment is the key factor driving industry growth. Rising prevalence of acute as well as chronic sinusitis across the world will increase the number of people opting for sinus dilation procedures. According to the American Cancer Society, cancers of the paranasal sinuses and nasal cavity are rare, and affect nearly 2,000 people in the U.S. each year. Thus, growing rate of chronic sinusitis offer high growth potential to the players operating in sinus dilation devices market thereby augmenting the business growth. 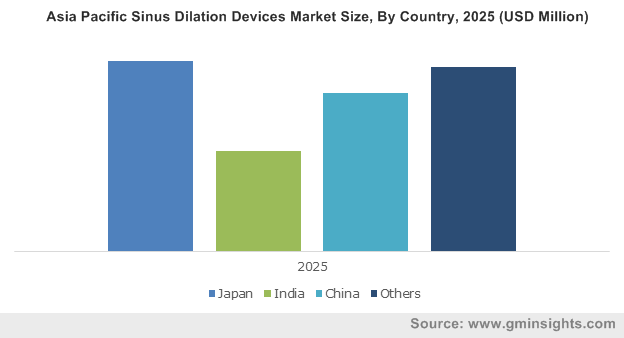 Furthermore, growing demand for technologically advanced and effective devices will boost the sinus dilation devices market growth over the coming years. Increasing focus of key industry players on new product development and product upgradation will influence the business growth. Patient preference towards minimally invasive procedures due to reduction in blood loss, less recovery time and shorter hospital stays will surge the adoption of sinus dilation procedures thereby accelerating the sinus dilation devices business growth. However, lower adoption of sinus dilation procedures in under-developed countries due to availability of sinusitis drugs and post-operative risks associated with sinus surgeries may hamper the industry growth during the forecast period. Balloon sinus dilation devices segment held largest revenue share of 33.5% in 2018. High segmental growth is attributed to high precision and operational flexibility of balloon dilation devices that offer maximum access control over sinus. Integration of advanced technology within these devices will further surge their demand thereby escalating the segmental growth. Handheld instruments segment is estimated to grow at 9.2% CAGR during the forecast period. Utilization of handheld devices as visualization aid and support during sinus dilation procedures to enhance surgical performance will increase its adoption. Growing cases of sinusitis will therefore spur the handheld instruments segment size during the analysis period. Standalone sinus dilation procedures segment accounted for USD 1.3 billion in 2018 and is estimated to show similar trend during the forecast period. The segmental growth is attributed to benefits offered by standalone procedures such as quick relief and reduction in long-lasting cold symptoms and blocked nose. Moreover, high adoption of these procedures among geriatric patients owing to minimal surgical complications will further favor segment growth. Hybrid sinus dilation procedures segment accounted for considerable revenue in 2018 and is projected to show 9.1% CAGR during the forecast period. Hybrid sinus dilation procedure is a combination of standalone sinus dilation with functional endoscopic sinus surgery (FESS). Thus, procedural benefits offered over the conventional sinus dilation procedures will increase its adoption in coming years. Hospital segment was valued at USD 830.4 million in 2018 and is estimated to show lucrative growth during the forecast period. Segment growth is attributed to the well-equipped hospitals in developed economies and availability of technologically advanced sinus dilation devices that assure utmost accuracy. Government initiatives and reimbursement policies for sinus will further upsurge revenue size. Physician’s office segment held substantial revenue share in 2018 and is projected to witness 10.0% CAGR over the coming years. Procedures at physician’s office are carried out within a single day thereby enabling faster patient recovery. Growing preference of patients with rhinosinusitis towards physician’s office is expected to foster business growth. Moreover, increasing number of physician’s office that are well-equipped with technologically advanced sinus dilation devices and instruments will spur the segment size. 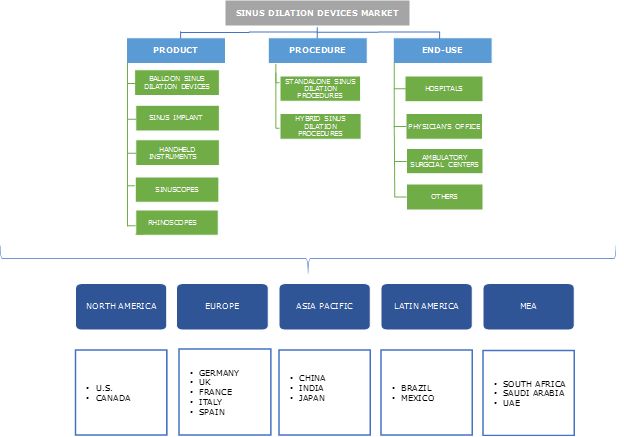 North America sinus dilation devices market dominated the global market with 34.6% revenue share in 2018 and is anticipated to show similar trend during the forecast period. High market share is attributed to surging incidence of chronic sinusitis in the region. Increasing demand for efficient and technologically advanced dilation procedures will drive the industry growth. Moreover, fair reimbursement scenario for certain sinus procedures including Functional Endoscopic Sinus Surgery (FESS) will further favor regional growth. Asia Pacific sinus dilation devices market is projected to witness robust CAGR of 11.0% over the forthcoming years. Regional growth is attributable to the large patient base suffering from acute or chronic sinusitis. Moreover, increasing awareness regarding minimally invasive sinus dilation procedures among the patient population and improving healthcare access for treatment will further accelerate Asia Pacific regional growth. Some of the prominent business players operational in sinus dilation devices market include Acclarent, Creganna Medical, dalENT Medical, Entellus Medical, InAccel, Intersect ENT, Jilin Coronado Medical, Medtronic, Meril Life Sciences, Olympus Corporation and SinuSys Corporation. Industry players implement various strategic initiatives including merger, acquisition and new product launch to uphold their market position and strengthen their product offerings. For instance, in July 2016, Acclarent announced the availability of RELIEVA SCOUT, a multi-sinus dilation system in the U.S. The new system will enable surgeons to carry out minimally invasive procedures more effectively thereby protecting patient’s natural anatomy. Such innovative product launch will enhance company’s product portfolio and strengthen its market position. The history of sinus dilation devices can be traced back in the late 19th century 1957 when Henri Luc and George Caldwell defined the canine fossa approach to maxillary sinus. The first nasal endoscopy was performed using a modified cystoscope by Hirschman in 1901. Hopkins rod telescope was patented in 1906. Later in 1980s, Stammberger published a series of papers on Functional Endoscopic Sinus Surgery (FESS), a surgical treatment for sinusitis and nasal polyps. Further in the early 2000s, balloon sinuplasty, a novel technique has revolutionized sinus surgery. Since its introduction in 2004, in the U.S., balloon sinuplasty has become popular across the world. Its sophisticated technology uses balloon dilatational systems for dilating the sinus ostia by a minimally invasive approach. The satisfactory results of these devices in patients with chronic sinusitis have increased its adoption in recent years. 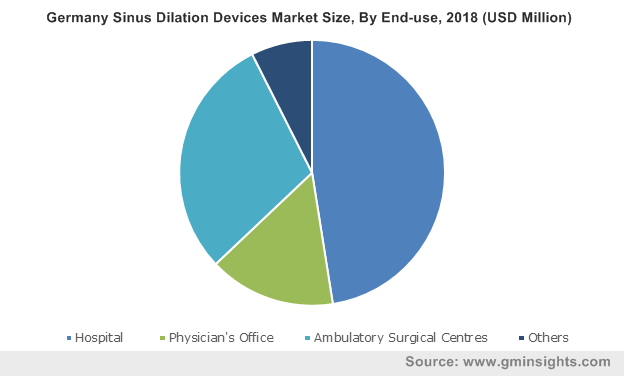 Increasing focus of industry players on development of innovative and technologically advanced devices coupled with growing patient preference towards minimally invasive procedures will accelerate the sinus dilation devices business growth over the coming years.